American University of Caribbean School of Medicine. The American University of the Caribbean School of Medicine (AUC) was founded in 1978 and is an international, for-profit, U.S. curriculum-based  medical school located in the suburban setting of the town of Cupecoy. Since 2011, it is officially accredited by the Accreditation Commission on Colleges of Medicine. The 40 years old higher-education institution offers courses and programs leading to officially recognized higher education degrees such as pre-bachelor degrees (i.e. certificates, diplomas, and associate or foundation degrees), doctorate degrees in several areas of medical study. AUC has a selective admission policy which is based on entrance examinations/ MCAT and students’ past academic record and grades. International students are always encouraged to apply for enrollment. AUC offers a number of academic and non-academic facilities and services to students. MD program curriculum consists of Medical Sciences and Clinical Sciences part. The first five semesters at AUC focus mainly at medical sciences through AUC’s US-modeled medical school curriculum. The study consists of Anatomy, Histology and Molecular/Cell Biology, Molecular/Cell Biology, Physiology, Pathology, and Behavioral Sciences. During the clinical portion of AUC’s medical program, students are part of an active member of a team comprising of students, residents, and attending physicians. Students implement histories and physicals, assess laboratory data, examine information to analyze patient cases, and undertake limited procedures under supervision. The clinical science curriculum is separated into core and elective rotations. Core rotations are the foundation of a student’s clinical medical education. Elective clerkships are medical subspecialties under each of the main core rotations. Students choose their electives according to their preferred area of postgraduate residency training. When the students have completed the medical sciences portion of the curriculum, they move on to clinical rotations in the United States or the United Kingdom at AUC-affiliated teaching hospitals. AUC students have the option of completing clinical rotations at affiliated hospital teaching sites in the United States and United Kingdom. Students must pass USMLE Step 1 prior to beginning core rotations. To practice in the United States, all graduates of international medical schools have to take and pass all steps of the USMLE. Only then they can obtain a licensure to practice in the U.S. Because USMLE is such an important exam, The AUC medical school curriculum includes elements designed to prepare students to succeed on these important exams. The USMLE Step 1 score is significant in showing how competitive you are for the residency. The medical sciences portion of AUC’s curriculum is designed and taught in such a way that it prepares for Step 1. USMLE Step 2 CK and CS scores are imperative to residency directors. The foundational knowledge students are taught through the clinical sciences curriculum is aimed at increasing student’s USMLE preparation for the Step 2 Clinical Knowledge (CK) and Clinical Skill (CS) sections. AUC does not charge an application fee. Students can complete and submit their applications to AUC without paying an application fee. Evaluation for admission is conducted on an individual basis. American University of the Caribbean School of Medicine’s (AUC) Admissions Committee basis its decision on many factors when going over an applicant for consideration. These include undergraduate performance and MCAT score, as well as intellectual and social maturity, critical judgment, adaptability, volunteer work, and life experiences, and graduate school performance (if applicable). Bachelor’s degree: All students who enroll in American University of the Caribbean School of Medicine (AUC) must hold a baccalaureate degree from an accredited university. The candidate should have given a MCAT. AUC does not consider MCAT scores that are more than five years old. Undergraduate performance: Your grade point average matters for admission. It includes both overall GPA and prerequisite GPA. Biology: 1 year, including laboratory work. Prospective students will benefit by taking courses in one or more of the following: Genetics, Cellular Biology, Developmental Biology, and Comparative Anatomy. Organic Chemistry: 1 year, including laboratory work. Coursework should include both aliphatic and aromatic compounds. General Physics: 1 year, including laboratory work. General introductory coursework should include mechanics, heat, light, sound, electricity, and nuclear radiation. A personal statement, no longer than 750 words. AMCAS (American Medical College Application Service) personal statements are also accepted. Trustees Academic Excellence Scholarship: Awarded automatically to qualify incoming AUC students based on their excellent overall undergraduate performance and MCAT score. Dean’s Academic Scholarship: Awarded automatically to qualify incoming AUC students based on their excellent overall undergraduate performance and MCAT score. Academic Merit Scholarship: Awarded automatically to qualified incoming AUC students for their solid overall undergraduate performance and MCAT score. Alumni Heritage Scholarship: Awarded to qualified applicants who have a work/volunteer history with an AUC graduate. Canadian Scholarship: Awarded to qualified applicants who are Canadian citizens. Community Outreach Award: Awarded to qualified applicants who have shown exceptional dedication to their communities, hospitals, or charities. First Generation MD Award: Awarded to qualified applicants who are striving to be first generation physicians within their families. MERP Advancer Award: Awarded to students who have excelled academically and provided leadership to peers during the Medical Education Readiness Program. Mississippi College Partnership Scholarship: Awarded to qualified students who have completed Mississippi College’s MS Biology (Medical Sciences) program. UK Scholarship: Awarded to entering AUC students from the United Kingdom who meet scholarship requirements. Class Notes: Attend all the classes and make sure you not only listen to the lecturer but also make pointers for what is being taught. Study groups: Make a study group for subjects you are suffering. Set a time when everyone is free, and sit together to understand the concepts. This way of teaching one another is very effective. Dr. Najeeb Lectures: World’s Most Popular Medical Lectures trusted by 80% of Medical, Dentistry, Nursing & Pharmacy students in 190 countries. The video library consists of 750+ videos ranging through all the subjects included in American University of the Caribbean School of Medicine’s curriculum. They are a great way to understand those concepts which are very hard to grasp. He explains everything in great detail, builds up the concepts gradually along with drawing diagrams. The 750+ video lectures, on Gross Anatomy, Neuroanatomy, Embryology, Histology, Physiology, Biochemistry, Genetics, Pharmacology, Microbiology, Immunology, and Pathology, available on his website will cover for all your unattended classes, a not-so-good-at-explaining professor or the most difficult to read a textbook. For a very minimal amount, you can get a lifetime subscription. He also has video lectures that will help you in your USMLEs, an important exam you will give during your time in AUC. Try Dr. Najeeb Lectures for FREE! Library: There are hundreds of books available in the library, on topics included in AUC’s curriculum. If your textbook is hard to read and understand, find any alternate book. FAQ’s about AUC Medical School. When is the application deadline for AUC? AUC admits three new classes each year, in January, May, and September. Therefore applicants may submit an application at any time. What is the process after an application’s submission? After an application has been submitted, it is assigned to an Admissions Advisor. The admissions advisor assists with the maintenance of a person’s file by letting them know what materials have been received or missing, and how to complete and improve their file for review. Can I transfer to AUC from another medical school? Yes. To transfer to AUC, all the medical courses taken at other recognized medical schools may be considered for transfer credit on an individual basis. What is Medical Education Readiness Program (MERP)? The Medical Education Readiness Program (MERP) is a medical school preparatory program offered to students who have been offered conditional acceptance to AUC. It is 15 weeks long. It is particularly designed to provide students from diverse backgrounds with added academic preparation to adapt to medical school for a successful journey ahead. It also helps AUC to determine the readiness of these students to meet the demands of a fast-paced and rigorous medical school curriculum like the one at AUC. Although MERP is an isolated program from AUC but for AUC applicants who are referred to MERP, it is their first step in the AUC journey. How is MERP Beneficial for me? What is the fee policy for MERP? MERP has a special no-risk fee policy that allows students who do not successfully complete the program to receive a refund of the full program fee. This policy applies to all MERP students who do not achieve passing grades, regardless of whether they complete the program or withdraw early. Where is MERP program held each year at? The MERP program is held in two locations. Miramar, Florida and Canadian College of Naturopathic Medicine in Toronto, Canada. Is past experience, including work in healthcare fields considered by AUC for admission? An applicant’s undergraduate performance and MCAT score are the main criteria. But the Admissions Committee takes into account many aspects including intellectual and social maturity, critical judgment, adaptability, and life experience. Does AUC Medical School offer scholarships? Yes, AUC offers a variety of scholarships designed to help students fund their medical education. You can apply for a scholarship depending on which one’s the criteria you qualify for. Is the MCAT Exam score crucial for admission in AUC Medical School? AUC and many other Caribbean medical schools’ admission committees look very closely at an applicant’s MCAT scores while considering a person’s inclination for medical school. This is because studies show that a student’s MCAT performance can be directly correlated to that individual’s future medical school performance. The best time to take MCAT is when you have prepared to your fullest and are ready. Also, MCAT scores aren’t released instantly. The AAMC releases score roughly 30 to 35 days after any given test date, so there is a brief lag time that could potentially impact your medical school application. And if you retake the exam, some schools, including AUC, will consider both scores. So plan accordingly. What is the application checklist for UK students? What should the personal statement of student from UK include? If you are from UK and applying to AUC, you should provide a personal statement no longer than 750 words regarding your medical career expectations. The statement should summarize your aims for your medical career, the individual attributes that qualify you to become a physician, and your valuation of your ability to meet the technical standards of the AUC both under the pressures of life on a Caribbean island and in clinical settings which may differ from the cultural and logistical features you are accustomed to. How should students from outside US attest their transcripts? All diplomas and coursework from outside the United States must be evaluated by a credentialing service that is a member of the National Association of Credential Evaluation Services (NACES). Is the Interview for UK students any different? Unlike the traditional UK or multiple mini-interviews, you’ll complete one-on-one interviews with AUC’s Associate Director of Admissions for international applicants and Admissions Committee Chair. How you conduct yourself during this interview is important, and is considered along with all other factors in a candidate. Interviews are conducted via Skype unless an AUC representative is in the area. How should Canadian Students apply to AUC Medical School? In American University of the Caribbean School of Medicine (AUC), Canadian students comprise about six percent of the AUC student body, a number that is ever growing as AUC’s Canadian graduates continue earning residencies and fellowships in both the United States and Canada. Applying to AUC is a very similar process to applying to a medical school in Canada and AUC’s admissions requirements are mainly the same. Though AUC does not participate in the Ontario Medical Schools Application Service (OMSAS), you can easily apply to AUC online. Why should Canadian Students apply to AUC Medical School? An opportunity to see a different type of healthcare system. Whether you choose to complete your clinical rotations in the United States or the United Kingdom, you can see an entirely different healthcare system in action. Given that the practice of medicine is becoming increasingly globalized, this experiential learning could help you add a valuable, broader perspective of how varying healthcare systems operate. What are the facilities and technology to support Medical students in AUC? How is the life on the Island “St. Maarten”? St. Maarten is an island in the Caribbean, located approximately 150 miles from Puerto Rico. 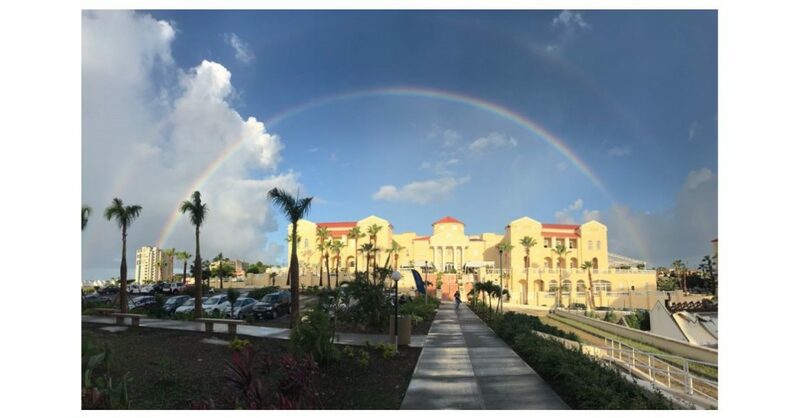 The island is shared by the governments of France and the Netherlands Antilles, with the AUC campus located on the Dutch side. Although English is spoken everywhere on St. Maarten and the U.S. dollar is an accepted currency, the island as a whole retains many elements of its French and Dutch culture and heritage. St. Maarten’s central mountain range is complemented by pristine beaches, winding mountain roads, and small villages. At AUC, you will learn about St. Maarten’s exciting blend of Dutch, French, African, and American culture. With residents from more than 90 different ethnicities, art and music from around the world, and cuisine ranging from French to Vietnamese to American fast food, daily life is as diverse and vibrant as you want it to be. How is on-campus housing at AUC Medical School? How is off-campus student housing at AUC Medical School? AUC’s Department of Housing maintains a database of off-campus housing options from which you can search based on criteria such as housing time, amenities, and price levels. The monthly cost for off-campus rental will depend on such things as quality, location, pet fees, and whether or not utilities are included. What are the recreational aspects on the island for students of AUC Medical School? The AUC campus oversees St. Maarten’s beautiful Simpson Bay Lagoon and is adjacent to the 18-hole championship Mullet Bay Golf Course and Mullet Bay Beach. Students can access beaches, diving, sailing and sports activities, and countless local markets, and duty-free shopping. Some of the more popular beaches for medical school students include Sunset Beach, Mullet Bay Beach, and Orient Beach, which are popular destinations for snorkeling, jet skiing, kite surfing, windsurfing, and parasailing. St. Maarten also features movie theaters, golf, and mini-golf. Shopping is one of the most popular aspects about St. Maarten Island. St. Maarten offers a vibrant nightlife scene featuring live entertainment venues and nightclubs. With more than 400 restaurants on the island, the cuisine offerings include French fare, Italian, Tex-Mex, Thai, Vietnamese, Indian, Japanese, Chinese, as well as local BBQ ribs and chicken. Learn more about AUC Medical School on their official website.